The region of Chettinad of Tamil Naduu gained prominence when the Chettiar community moved in here during the 12th century from the coastal areas due to a cyclone that washed away their homes. Located in the districts of Shivganga and Pudukottai, Chettinad sprawls over 75 villages, of which the prominent ones are Karaikudi, Athangudi, Kanadukathan, Pallathur and Devakottai. The Chettiars were financiers and traders who dealt with silk, teak, spices etc. with south eastern countries, travelled extensively and lived an extravagant life in their massive houses known as Chettinad mansions or Nattukottais. They were ardent worshipers of Shiva and each of the nine clans had a separate temple. Chettiars being traders in spice, the region also got popular for its cuisine peppered with aromatic spices. Though the fortunes of the community declined over the years and they moved to various parts of the country, they have left behind some stunning heritage from the bygone era. A visit to some of the villages in Chettinad offers quite a few interesting things to experience. The numerous alleyways of Kanadukathan are a delight to walk through in the evenings. The sparsely populated village is lined with numerous Chettiar mansions amidst the smaller tile roofed houses of the locals. Many of these structures are dilapidated, abandoned or looked after by a caretaker. Some of them have been well maintained, while many of them have been pulled down long back. The owners visit occasionally and these once palatial homes remain shut otherwise. A few of them like VVR house and CVRM House allow visitors inside for a nominal entry fee. A few like Chettinad Mansion have been converted into heritage hotels. Raja’s palace, the mansion that belonged to the King of Chettinad is the most magnificent structure in this village. Kanadukathan village has the most number of such mansions in Chettinad. Athangudi village is home to the most opulent mansion in Chettinad, Athangudi Palace. The sprawling palace which extends from one street to another showcases Chettinad architecture and design in its full glory. Built in early 20th century, the palace is adorned with imported wood, marble, tiles and mirrors from world over. The mansion also has innumerable artwork all over and has been well kept over the years for the visitors to have a glimpse of the glorious past of the Chettiars. The tiles made in this village have a great value in the market and are known for their floral designs. These cement tiles are handmade over glass surfaces and that sets them apart from the machine made ones. Sri Ganapathy tiles on the road that leads to Athangudi palace is an ideal place to see these tiles being made. From frames to colours to mixes and glasses, they will take you through the making of a tile. Please do not forget to tip them. The Chettiars belonged to nine different clans and each of them have their separate temples mostly dedicated to Shiva. These are located at Pillaiyarpatti, Soorakkudi, Nemam, Ilayathangudi, Vairavan koil, Iranikovil, Velangudi, Iluppaikudi and Mathur. Pillaiyarpatti Vinayagar kovil is one of the prominent ones in this and is a rock cut temple built in the 5th century. Thiruvenkadamudaiyan temple dedicated to Vishnu is another popular temple near Karaikudi. Built in 17th century, the temple is also referred as Then Tirupati (South Tirupati). Built in 17th century by Vijaya Raghunatha Devan, one of the local kings, the fort is on a rocky outcrop and overlooks the open lands near Kanadukathan. Presently, only the fort wall remains along with a bastion and a canon atop it. The fort also houses two shrines dedicated to Shiva and Vishnu. This is an ideal place to visit in the evenings to enjoy the breeze and sunset. If you have a penchant for antique, then a visit to Muneeswaran Koil Street in Karaikudi would be a delight. The antique market here is an absolute treasure trove with a wide range of items. Many of things that are on sale are from the Chettinad mansions that were sold or pulled down due to dilapidation. From wooden pillars to archaic furniture to paintings to brassware to unique kitchen utensils, the shops have a plethora of items on sale. 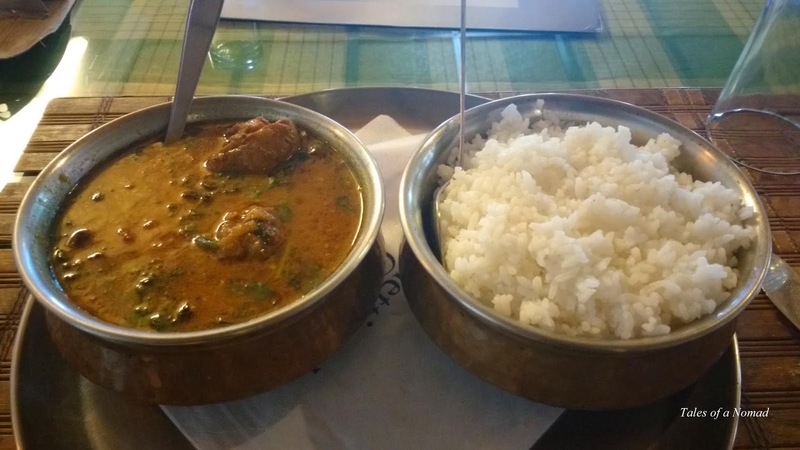 It would be blasphemous to leave Chettinad without having a taste of its renowned spicy cuisine. Known for its aromatic spices, the spread is similar to that of a typical South Indian fare but with its own distinctiveness with regard to preparation and ingredients. vegetarian meals with a meat dish (chicken or mutton) are well recommended. 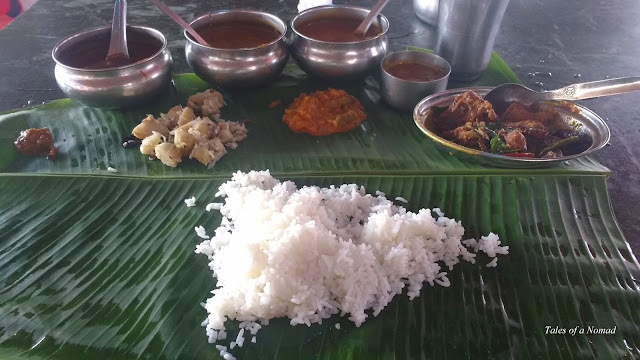 There are numerous restaurants in Karaikudi such as Friends, Karaikudi Annalakshmi, Chettinadu Court, Thappa Gardens, Amsavalli Bhavan and The Bangala that serve delicious Chettinad cuisine. Karaikudi is the major town in Chettinad and is well connected to all major towns of Tamil Nadu. The nearest airport and railhead are at Madurai, 80 Kms away. You can either stay in Karaikudi, which has a lot of hotels or in Kanadukathan, which is a serene village with a few accommodation options. I stayed at Chettinad Packer hostel in Kanadukathan. Chettinad looks like a charming place in terms of architecture and history. The hand-made tiles look beautiful. Absolutely, a treasure trove for history enthusiasts.